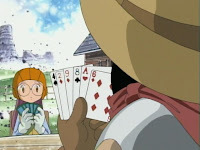 After a dramatic mini-arc about Tai's partner being enslaved by the Digimon Emperor, we are suddenly thrown into a Wild West pastiche, where a sheriff and deputy attempt to out-ham each other, where Sora presents the closest thing this season has to fanservice and where TK and Kari don't even bother showing up. The episode makes no sense, contributes nothing to the plot and leaves me scratching my head on several occasions. And this isn't even the episode guest-written by H.P. Lovecraft. That's next week. 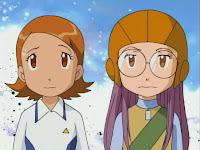 It's certainly fun though, much in the same way the Bakemon episode was last season. As I said then, turn your brain off and don't delve into it. As I also said then, I'm tasked with delving into it anyway. First off, I love the fact that Kari and TK are MIA for no particular reason. Kari takes Gatomon out for a leisurely walk along the shore, not bothering to check her D-Terminal before leaving. TK and Patamon decide to sleep in. Had either of them read their e-mail, they would have gotten an urgent message that Biyomon was in danger. I can imagine the conversation Davis and Yolei have with them the next day. 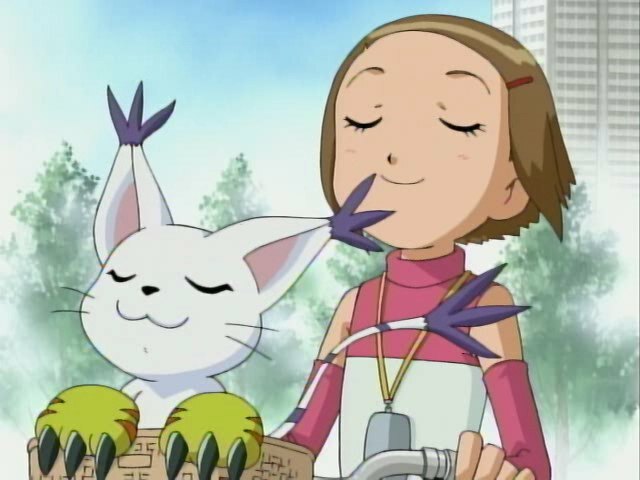 Anyway, it is in fact another “season one Digimon in trouble” episode similar to four, five and six. This time, Sora gets the call and ditches her tennis practice to check in. Yes, she wears the tennis outfit into the Digital World and yes, it's kinda fanservice-y. Still, it pales in comparison to some of the random gratuity in Data Squad and Xros Wars. And it's certainly better than a towel. The kids aren't really the focus of this episode anyway. Starmon and Deputymon steal the show here with their brash, cowboy attitudes and unique sensibilities. Starmon introduces himself as the just sheriff in town, treating the team to mugs of milk before admitting that he has a Dark Ring and is actually working for the Emperor. He captures them with a massive meteor attack and yields the stage for Deputymon, who is somehow even more insane. Deputymon has no dark ring (stripping down completely to prove it) and arrives not to save the day, but to find card players. But only girls. Because boys cheat. Starmon returns to find Yolei, Sora and their Digimon gone and goes into Rage Mode (complete with random energy bar), interrupting the card game by demanding a showdown. Deputymon cheats at it... and gets wasted by Starmon anyway. By then, Davis and Cody had engineered an escape and Flamedramon knocks Starmon into the control spire, fixing everything. Holy crap, Davis actually uses the goggles, and uses them correctly! In the middle of a sandstorm, he straps them on to keep the sand out of his eyes. They do something after all! I know what you're thinking- pints of milk being served in a Wild West saloon? Has to be a dub alteration, right? No! It's milk in the Japanese version too! Amusingly, the actual alteration is that the control spire was not hidden behind a water tower, but rather the gallows that Starmon was stringing up for the kids. Something about hanging twelve year olds must have caught the censors' attention. Starmon is amazingly talkative for somebody under control of the Dark Ring. Most previous Digimon had been reduced to zombies, or were at least confrontational in their conversations, but Starmon was quite friendly with the kids before reluctantly admitting that he was not their friend. Stupid as Veemon was to attempt to headbutt the jail wall, the Veemon-shaped mark he left on the wall was pretty amusing. The most adorable thing in this episode was Upamon practicing kendo. It narrowly beats out Starmon's bento box with a cutesy picture of the Digimon Emperor on it. Technically, this episode was probably intended to demonstrate that Veemon can now evolve into both Flamedramon and Raidramon interchangeably. It's a new and interesting concept, but not something that needed its own episode. What got me about this episode was that after Starmon reveals his dark ring, everyone just sort of chats about it, in a "How about that?" sort of way. Furthermore, everyone RUNS from Starmon, despite how often they've taken out dark ring-ed digimon before--especially odd considering due to how long Starmon's Meteor Shower/Stream's charge time is, the attack only really worked BECAUSE they were running! It's been years since I've seen this one, maybe it's not so bad after all but every time I think about how ridiculous this series often was, this is the episode that always comes to mind. One thing that I found odd about this episode was how Deputymon let Hawkmon hang out while he's playing cards with the girls. Isn't Hawkmon male?